This pendant is beautiful. The price was right, too. 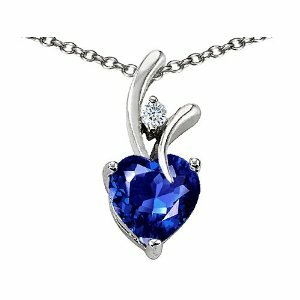 I bought this as an anniversary present for my wife (sapphire is the stone for September, the month we were married) and she absolutely loves it. It came with a fairly high quality chain, which was also a bonus. I would recommend this as a nice looking piece of jewelry that won't break the bank. I bought this as a Valentines day present for my girlfriend and she hasn't been seen without it since. She loves it and she and I thought it to be very high quality and have found no negative qualities. Very nice stone and chain.